Two hit men chat and kill their way across the sprawling Los Angeles landscape. 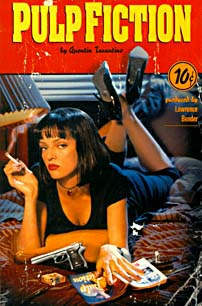 Director Quentin Tarantino's, "Pulp Fiction," is a lurid, profane and highly entertaining look at both pop culture and societies' low-lifes. Tarantino received a nomination for best directing. Perhaps the best crime drama ever. The sparkling cast includes: John Travolta, Samuel L. Jackson, Bruce Willis, Uma Thurman, Harvey Keitel, Tim Roth, Amanda Plummer, Maria de Medeiros, Ving Rhames, Eric Stoltz, Rosanna Arquette, and Christopher Walken.